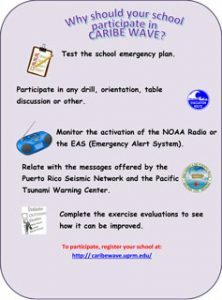 The Puerto Rico Seismic Network urges all state, federal and private agencies, educational institutions, health facilities, media, communities, families and individuals in the region of Puerto Rico and Virgin Islands to participate in the CARIBE WAVE 2019 Exercise. By participating in this exercise the public will be able to test their emergency communications systems, their emergency response plans, their evacuation plans, and perform other activities that prepare us for a possible tsunami in our region. Each agency or individual should evaluate ways to participate based on the official CARIBE WAVE 2019 Exercise Participant Handbook and the PRSN Response Guidebook for the Puerto Rico and Virgin Islands Region. 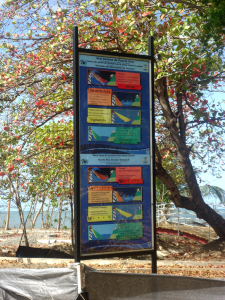 They must also determine the type of participation according to the resources available to them (see the exercise webpage for more ideas on how to participate, for example, emergency agencies, schools and Tsunami Ready municipalities). 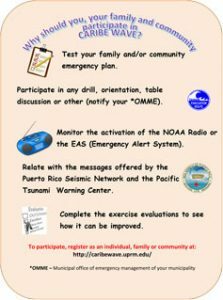 To obtain the official messages issued by the PRSN and the PTWC, visit the official PRSN website http://caribewave.uprm.edu during the exercise on March 14. 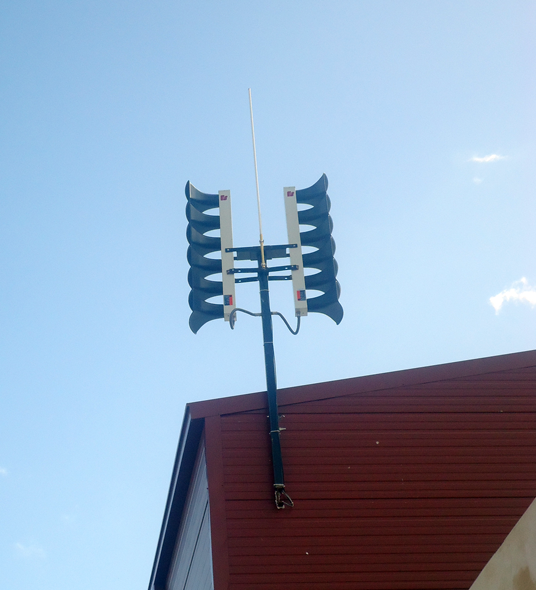 Monitor the activation of EAS (through radio and TV). Monitor any activation via NOAA Weather Radio (if available). Monitor text messaging by PRSN (only for those registered mobile messaging list). This also depends on your cell phone provider. Follow the messaging publication through the Social Networks of the PRSN ( Facebook and Twitter). Revise and test the emergency plans and time of response if drills are coordinated. Complete Exercise Assessments to improve response times in our local area. Complete the official evaluation form of the exercise, before March 28, 2019 (if applicable). To download the General Public Promotion click on the image. 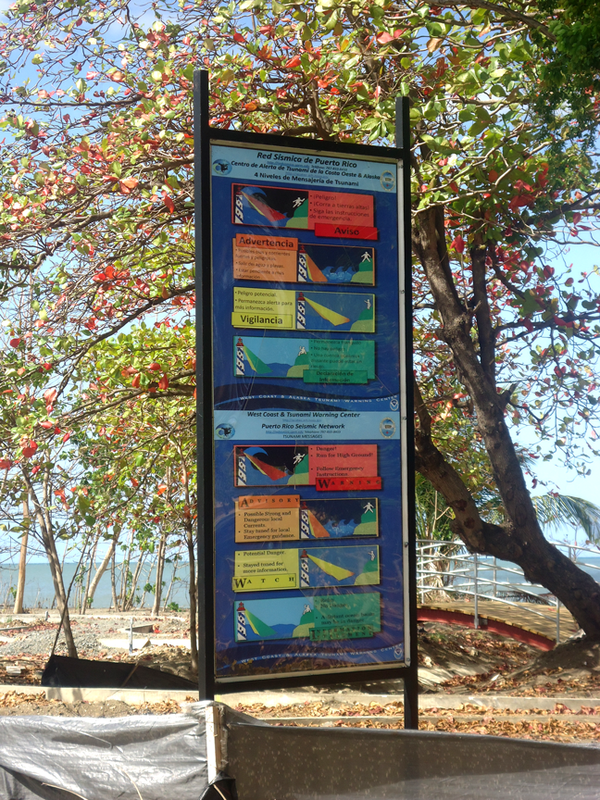 Why Tsunami Ready Municipalities Should Participate? For any other type of participation for the CARIBE WAVE 2019 Exercise, please inform your NMEAD Zone and the Puerto Rico Seismic Network (Tel. 787-833-8433). To download the Promotion for Schools click on the image. Educating on the subject of earthquakes and tsunamis is everyone’s responsibility. However, children and young people spend most of their day in school, so it is vital that this topic is discussed on the school campus and that all schools actively participate in exercises such as CARAVE WAVE. In this way, the school ensures a better response during a real emergency, thus minimizing the loss of life of the student body under their responsibility. The exercises also serve to determine which faults have to be corrected in the school emergency plan. On the other hand, if students feel better prepared to face this type of emergency we can minimize the number of people that could suffer from a Post Traumatic Stress Disorder. Posttraumatic Stress Disorder is a very common condition after an emergency situation, such as earthquakes and tsunamis. Why Should Emergency Agencies Participate? What are the emergency agencies in Puerto Rico and the Virgin Islands? Emergency agencies in Puerto Rico and the Virgin Islands should participate in CARIBE WAVE 2018 Exercise to test their emergency communications systems, their emergency response plans and evacuation plans, among other activities that prepare them for a possible tsunami response in our region. Not only these agencies must participate, we also invite other emergency agencies in Puerto Rico and the Virgin Islands such as: firefighters, police, paramedics (emergency medical technicians), 911 System, Health Department and other federal agencies such as FEMA. Each agency or individual should evaluate ways to participate based on the official CARIBE WAVE 2018 Exercise Participant Handbook and the PRSN Response Guidebook for the Puerto Rico and Virgin Islands Region. They must also determine the type of participation according to the resources available to them. Coordinate the realization of one of the 5 types of exercise in your area, region or municipality (document and report it to the PRSN, NMEAD-PR, VITEMA-USVI or DDM-BVI):. 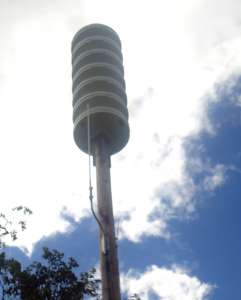 Complete the electronic evaluation of the Puerto Rico Seismic Network communications exercise, before the March 29, 2019 (using as a basis the information collected in their Communications Evaluation Sheets), through the link provided by email by the Puerto Rico Seismic Network. 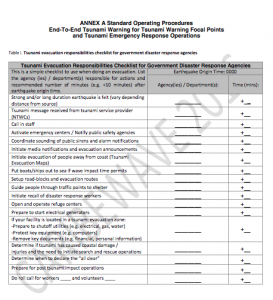 Download the Standard Operating Procedures by clicking on the image. 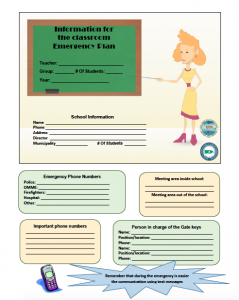 Download the Information for the Classroom Emergency Plan document by clicking the image. 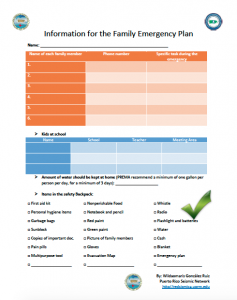 Download the Information for the Family Emergency Plan document by clicking the image.